Do you have someone who edits out fundraising best practice from your appeals? Someone who doesn’t like the urgency, postscripts, hyphens, folksy language, or handwritten notes? An Executive Director who wants people to know he has a PhD by editing in 12th grade language and changing 6th grade level writing? Is your fundraising suffering because of it? 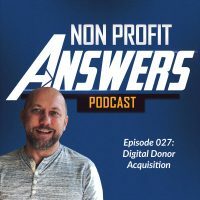 In episode 7, Jeremy answers a question from Julia about how to handle an Executive Director who doesn’t understand fundraising and is undermining her efforts. Several similar questions came into Nonprofit Answers. They’re all around this topic of someone within your organization, like an executive director or board member who’s not part of the development team, taking your fundraising appeals and editing them and editing out much of the best practices of your fundraising appeals. This is like if you were going to take your car into a mechanic and you were to diagnose the ping in the engine for him, instead of allowing him to do his job, or like going to the doctor and pointing out a pain that you’ve been having and telling the doctor what that pain is. Fundraising is a profession. The professionals in charge of fund raising know the best practices and things that they should do in fundraising in order to raise funds for the organization. When someone who does not have this fundraising expertise tells the fundraiser how to fundraise, then it often ends with results that are not desired by anyone. Today’s question from Julia really addresses that topic of how do we deal with someone, like an executive director, who wants to edit out fundraising best practices in our fundraising communications. Hey, I have a problem with my fundraising appeals. Well, it’s not really a problem with the appeals. My name is Julia, and I’m the Development Manager for a small nonprofit in Tulsa. Our executive director heavily edits our appeals and changes things that I have read are fundraising best practices. I think our fundraising is suffering because of the changes he makes. The changes are things like removing urgency and softening direct asks for money. How can I communicate to him that he shouldn’t be changing the copy? Hi, Julia. Thanks for your question. Many of us can relate to your problem, have experienced people in the past who think they know more about fundraising than we do, and they edit our fundraising appeals or even worse, fundraising [inaudible 00:02:08] committee where you have several people who edit the fundraising appeals, thinking that what they’re doing is helping when in fact what they’re doing is removing the best practices that make fundraising work. In your case with your executive director, really wanting to change some of the things in your fundraising appeals, what he or she is really doing is editing out the punch of the fundraising, and editing out the ability for that fundraising to do its job. This makes a ton of sense. Fundraising is a profession. Fundraising, like all professions, has rules. It has customs, and it has things that work and things that don’t work. Tom makes a point here to say that the person who’s in charge of fundraising should decide what goes into the communications that go out and raise funds. This is of course if the fundraiser is being honest with the appeal, that the fundraiser is appealing in a way that reflects well on the organization. Then that person should have the final say on what goes in to fundraising. I very much recommend a book that’s called The Fundraiser’s Guide to Irresistible Communications. It’s by Jeff Brooks. Jeff has a knack for teaching how and why the customs of direct marketing, why we do the things that we do. That book, I’ve used that book a number of times, gifted it to people who don’t quite fundraising for them to understand the customs. Though they may not agree with or want to do those customs, at least they understand why we do the things that we do in our direct marketing fundraising. I’m going to give you six ideas today on how you can help your executive director with understanding what you’re doing in your job, why you do what you do, and how the executive director can be involved with the fundraising without changing specific things that make the fundraising work. The first of those six things is I want you to work with your executive director to create a fundraising strategic plan. This shows some measure of respect to your executive director to ask his advice on fundraising and strategically what you want to accomplish with fundraising with your organization. Now of course, strategic is different than tactics. The strategy of your fundraising is what is the map of where you want to get to your goals for your organization, for your fundraising. What does that map look like? It’s not the specific day-to-day execution of fundraising campaigns, nor is it the day-to-day editing of fundraising materials. It is the map by which you want to use your fundraising to reach the goals for your organization. Second, ask for strategic advice from your executive director, but ask that specific tactics are not questioned. As mentioned, strategy is not tactics. The executive director should be able to provide strategic advice and not talk to you about the specific tactics that you use within each individual fundraising campaigns. Fundraising is a career. Number three is to explain to your executive director that fundraising has a specific skillset, a specific set of rules, and a specific set of things that you need to do in order to make your fundraising a success for your nonprofit organization. Number four, show the impact and results of your fundraising campaigns. In this, you’re going to demonstrate that the tactics that you’re using are getting results for your organization. Number five, use testing within your direct marketing. This is very easy in the digital space where you can AB test two different types of fundraising messages and show the results of what happens when you do or don’t use best practices. Now, one of the things that you’re going to need to watch out for here is that you’re testing with a large enough sample size to get good results. Use testing to demonstrate that the tactics that you’re using work in fundraising. Finally, number six, provide fundraising training to your executive director. A book like The Fundraiser’s Guide to Irresistible Communication by Jeff Brooks that I already mentioned, that’s a great tool to use to provide some fundraising training for your executive director so they understand what you’re doing and why you’re doing what you do. When it comes down to it, if you still can’t get through this impasse and your executive director continues to edit your appeals and take out much of the punch that results in fundraising happening for your organization, then it may be time to look for another organization where you can team up with an executive director that understands more that fundraising is a specific profession and a specific skillset, and that you’re skilled at achieving what you need to achieve to fundraise for a nonprofit organization. I know that’s a last-ditch effort there is to leave the organization, but if you have an executive director that does not allow you to do your job in a way that you know that you need to do it, then it may be time to look for a different role. Julia, thanks so much for your question. I hope that these steps help your executive director understand what your role is within the organization, and what specific things that you need him to do versus things that you need to do yourself. Take care. Thank you for joining us on the Nonprofit Answers podcast. Please take a moment and provide an honest rating and review on iTunes. Your review will help other nonprofit leaders find the fundraising answers they need to help more people. Visit us on the web at nonprofitanswers.org.